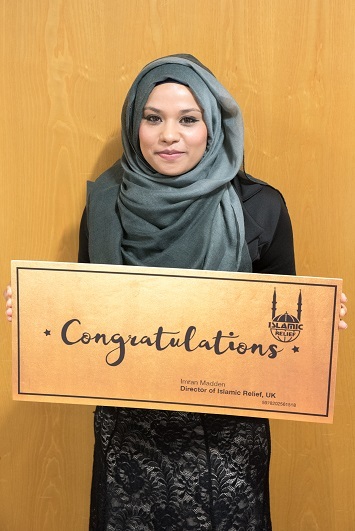 Alima Ali, a solicitor from Barry, has an Umrah trip for two to look forward to after finding a special ‘golden ticket’ in Islamic Relief’s first Ramadan mailing of 2016. Alima was presented with her prize – donated by Al-Hidayaah Travel – at our Welcoming Ramadan reception at Cardiff County Hall on June 2, which was addressed by faith and community leaders including Stephen Doughty MP. 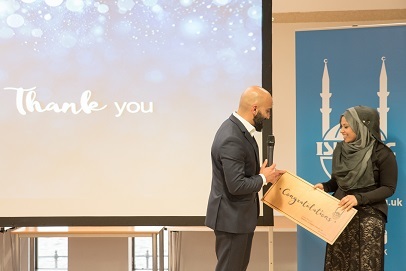 Alima spoke about how humble and happy she felt at winning, and said she had already ‘given back’ to those less fortunate by sponsoring two orphans through Islamic Relief. The 50 guests at the Welcoming Ramadan event were welcomed with a beautiful recital from the Qur’an by Sheikh Yaqoub Kutkut. Our Deputy Director, Tufail Hussein, then introduced Islamic Relief’s work around the world. Saleem Kidwai, General Secretary of the Muslim Council of Wales, highlighted the importance of working towards eradicating poverty both in the UK and worldwide. He said that people are going without food just a few minutes’ walk from our doorsteps, to it is important for Islamic Relief to help people at home as well as internationally. The Welsh Police Commissioner, Alun Michael, spoke about the long history of Muslims in Wales.